As well as there being a wide variety of paints there are a wide variety of mediums that can be mixed with and added to the various paints to create different styles and effects.For some people, these additions are essential to their practice, and for others they offer merely an extra ‘trick’ that may occasionally be utilised to enhance a painting's surface. In the case of oil painting, mediums such as linseed oil and turpentine (or a mixture of the two called, simply, ‘painter’s medium’) are essential to aid the flow of paint in thinner paintings, where ‘glazes’ of thin oil may be built up over time. Mediums such as ‘spectra gel’ may also be used in very think paintings to maximise paint usage: A small amount mixed in to oil paint bulks up the paint while retaining the full brightness and hue of the paint. There are many different types of painting mediums that can be purchased specifically for use with the type of paint that you are have chosen to work with. You will find some universal mediums such as linseed oil, although there is no universal quality standard that must have been adhered to in their manufacture. 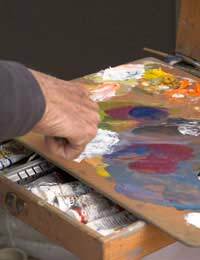 You will also find that many painting mediums, for whatever type of paint, are not standardised in any way, and to understand what they do there is no option but to read the label, and start by experimenting with the medium, working on small areas, before applying it to a fell final artwork. Using combinations of mediums built up over time may produce interesting effects, though be careful – mixing chemicals may jeopardise the stability of your painting, causing paint to flake, for example. Always experiment on small areas first and always read the advice on the label, making sure to heed the safety advice. Mediums to increase a paints flow arte the most commonly used, and have the benefit of saving paint, whilst also helping to produce lighter translucent variants of the colour you are using. Different colours can then be layered once each has dried, allowing subtle colour shifts to be made upon the canvas, rather than just by mixing upon the palette. Some colours have more intense pigmentation (such as black and blue) and can be thinned greatly before colours start to fade, whilst others will fade to pale translucent trace of their former self with relatively little medium used. Artists wishing to pile the paint on thick (especially in regard to acrylic and oil) are advised to thicken the paint with a suitable medium in order to avoid unnecessary waste (in terms of paint and money). Many people who paint thick will scrape the results of their painting off and start again many times before they have finished, so to use pure oil paint, at £5 a tube would make little sense. Mediums such as ‘Spectraflow’ also make the movement of paint smoother (somewhere between a normal paint and a heavily thinned one). ‘Retardants’ can be bought to slow the drying of acrylic paint, although better (and hence, unfortunately more expensive) acrylics tend to dry fairly slowly, emulating oil paints. Mediums can also be used to quicken the drying time of oils, which may be helpful if you know the processes you are going to employ and wish to speed up stages of painting in order to move on to later stages. A wide range of mediums can be used to produce metallic effects, gloss effects and other effects in painting. However, it is often argued that it is best to try and produce these effects employing more traditional methods: the production of different effects from the limited means afforded to the traditional painter is central to painting as a discipline. The best way to incorporate painting mediums into your work is to begin experimenting with them gradually, noting the effects they produce as you try them.